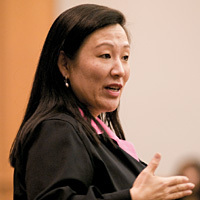 Tae Yoo, vice president of corporate philanthropy at Cisco Systems, delivers a keynote address at the 2004 Innovating Social Change Conference. The Innovating Social Change Conference 2004, held Oct. 6 at the James L. Allen Center, demonstrated how a world of good can be created from one that’s suffered environmental and ethical damage. Themed “Responsible Business as a Global Strategy,” the event featured leaders from the for-profit, nonprofit and public sectors, who highlighted the challenges confronting the world and the efforts of those in the business community working to solve those challenges. The conference was coordinated for the sixth consecutive year by the Kellogg School’s student-led Social Impact Club. Tae Yoo, vice president of corporate philanthropy for Cisco Systems, delivered the opening keynote address. Richard Caines, market development group for International Finance Corp.’s environmental and social development department, provided the closing keynote. Panelists reported on progress in corporate responsibility regarding the environment, sustainability, fair labor practices and the AIDS crisis. Attendees learned about the John G. Shedd Aquarium’s four-year-old program to encourage consumers to choose sustainably fished seafood when shopping or dining out. Called Right Bite, the Chicago aquarium program hopes to discourage harmful overfishing. The conference addressed other advances such as those of Bon Appetit, an onsite restaurant company that supplies food service management to corporations, universities and museums by using a “farm-to-fork” approach: The company purchases pesticide- and hormone-free produce within 150 miles of its cafes. Members of the Green Hotels Association contribute to conservation efforts by using low-flow showerheads, and soap and lotion dispensers instead of plastic bottles, among other measures. Three years ago, Nike created a new mission statement that includes providing education and micro-enterprise opportunities to improve the lives of impoverished families. For example, the company helped a group of women in Jakarta, Indonesia, start a plastic recycling business. The Worker Rights Consortium, a nonprofit organization of college and university administrations, students and labor rights experts, helps build supply chains that employ fair labor practices. Coca Cola, Abbott Laboratories and the MAC cosmetics company showed that corporate responsibility can be a driving force in helping stem the worldwide AIDS epidemic through education, healthcare, social service, advertising and consumer promotional programs. Despite these encouraging examples, conference panelists conceded that corporate responsibility is practiced by relatively few businesses today.